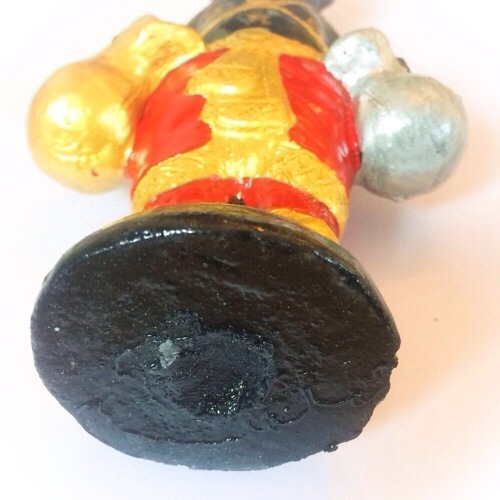 Pra Rahu Asura Deva, the God of Lunar Eclipse, is technically or advisably ,back in the limelight, because right now there are very heavy astrological influences upon the whole planet which are reducing peoples cash flow and ability to function properly, and manage their finances with flexibility. 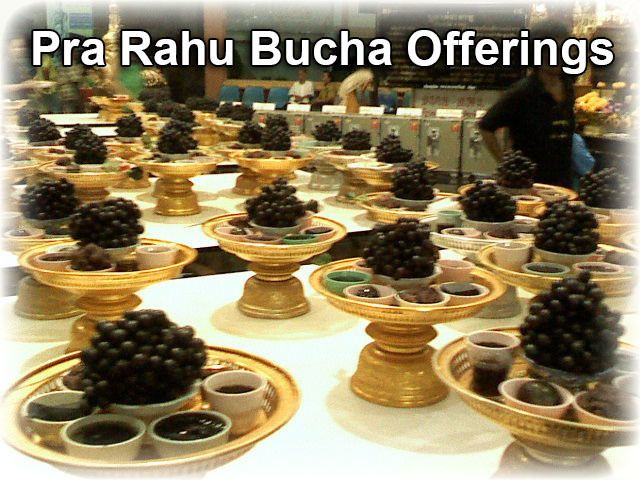 The heavens, advise strongly to increase Bucha to the God Pra Rahu or his equivalent, in order to clear away Karmic Residues amd the Heavy Influence of the Darker Astrological and Planetary Cosmic Forces upon Humans on Earth. 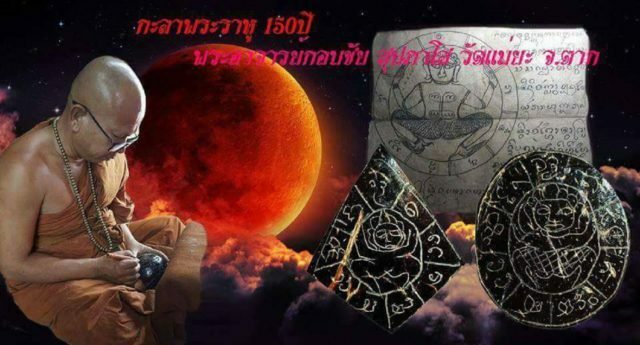 If there are any lunar eclipses occurring during this year of 2557 Buddhist era, these occasions should be used, to perform ritual Bucha to Pra Rahu. 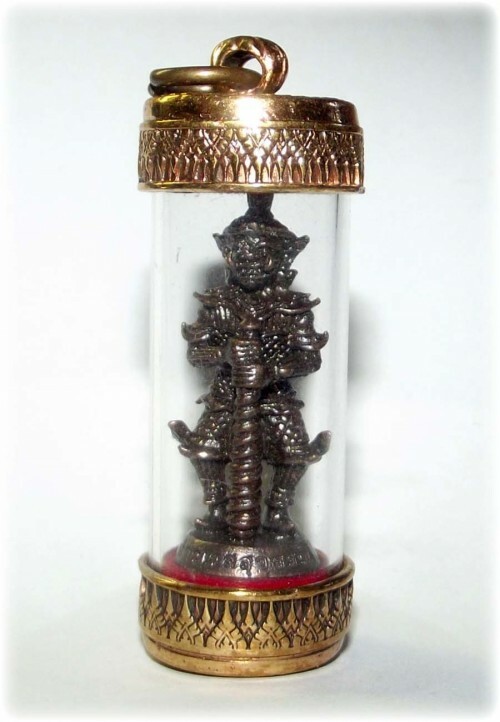 This is because, these occasions of the most powerful moments aligned to successful Sorcery and communication with the Asura Deva Pra Rahu. 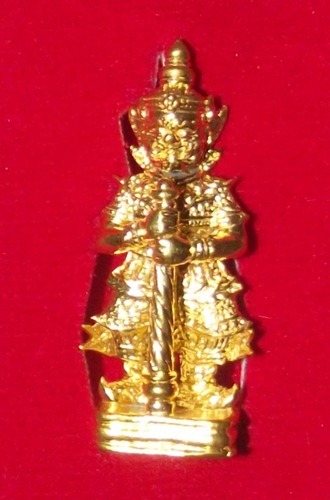 Kumarn Tong Yaks Noi Maha Pokasap – Asura Deva Baby with gold and silver moneybags. 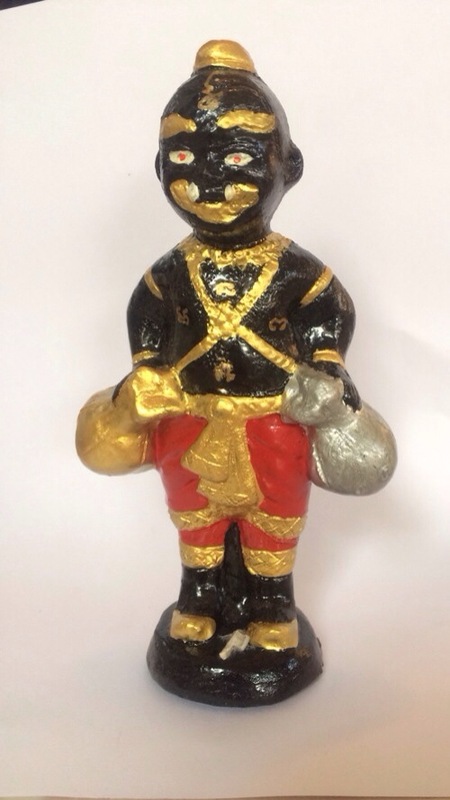 These Kumarn Tong statues in standing posture holding sacks of gold and silver are black skinned baby Yaksa Demons, or, more accurately described according to the original Vedic texts; ‘AsuraDevas”. 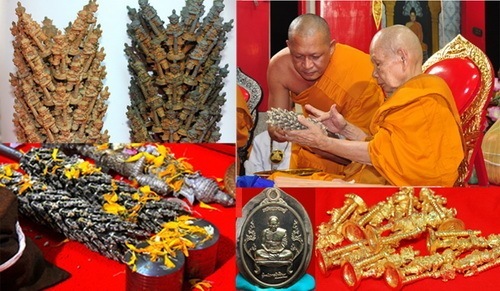 Made and empowered by one of this year’s greatest and most famous masters of the Wicha Kumarn Tong, Luang Por Dam, of Wat Pra Puttabat Radtana Kiree. 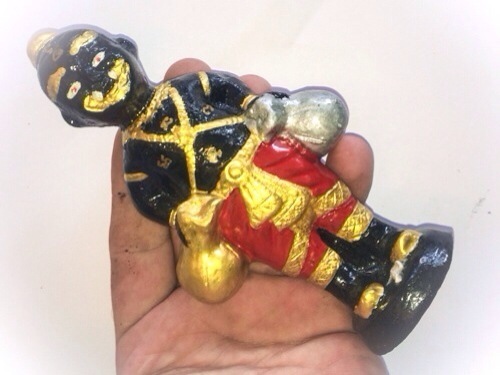 The statues are made from some of the most powerful rarest and ritziest sacred Necromantic ingredients,and other Muan Sarn Sacred Powders, of both necromantic and herbal origins. 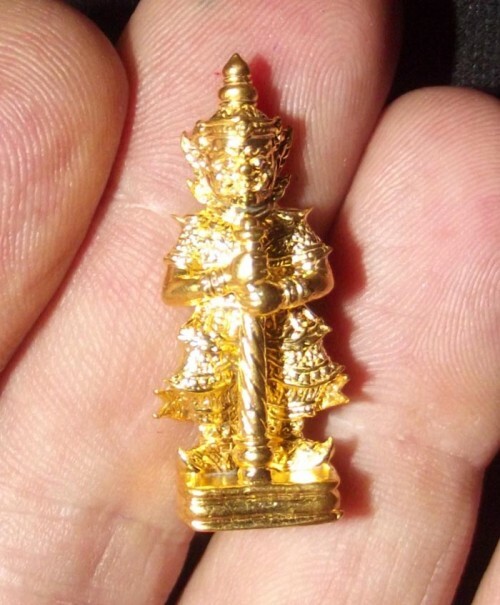 These particular kind of Kumarn Tong, are in Truth, something more than just a simple golden boy or Deva Kumarn. They are from a much higher realm, than those realms from where most of the ‘Kumarn Taep” Deva Kumarn Tong beings reside. 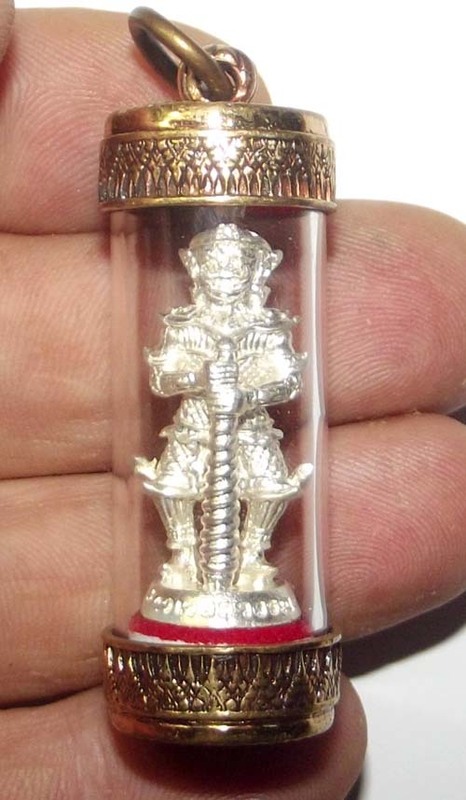 Asura Kumarn, live within the upper realms of the celestial heavens in the Jadtu Maha Rachiga Kingdom, which is ruled by the 4 great Asura Kings. 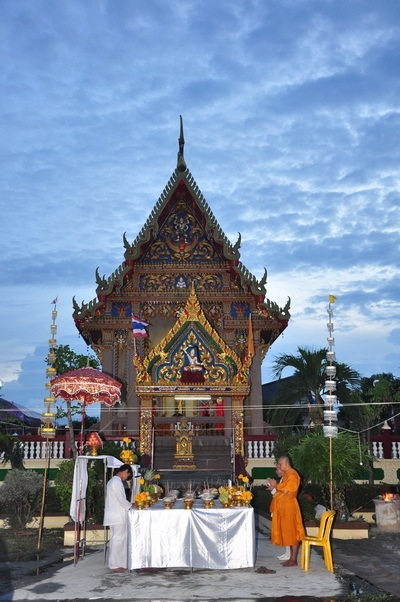 there are hardly any other masters in the present era, who can compete and compare themselves to the mastery of the great Luang Por Dam. 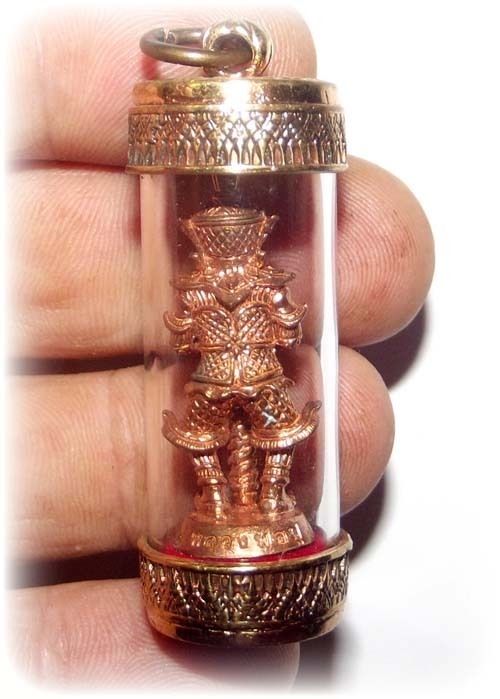 It is very special, to find this kind of empowered statue, with the spirit of an Asura Deva Being dwelling within, which emits the magic of Kumarn Tong, and has the immense Merits and Supernatural powers of the Asura Devas. 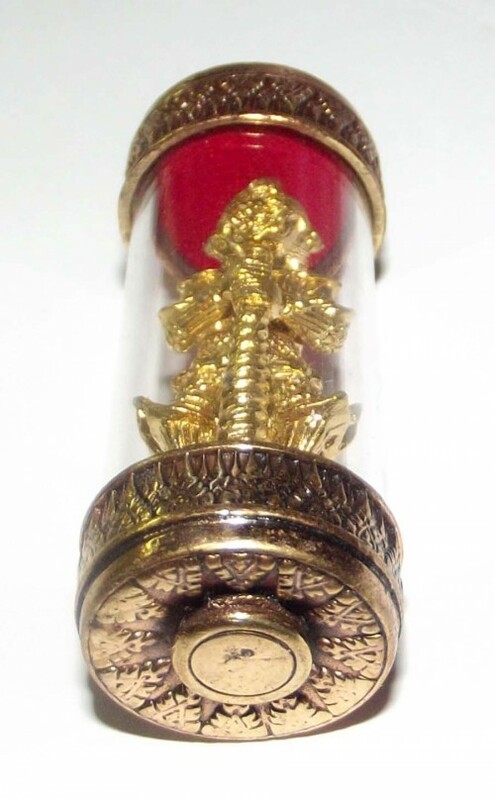 The Kumarn Tong Yaks Noi Maha Pokasap (nick-name for this particular release), is not only empowered with the usual powers which are in any case , manyfold, that people know to be attributed to the Kumarn Tong. 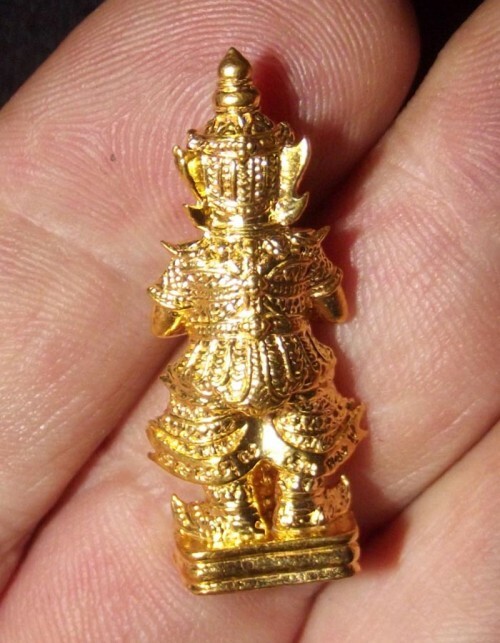 This particular statue is also empowered with great commanding influence, or as we say in Thai language; ‘Maha Amnaj”. 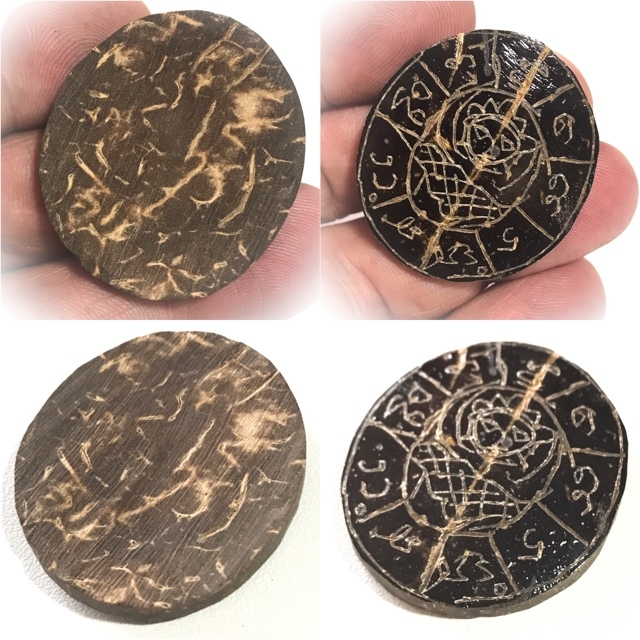 It has the power to ward off and send away any Demons are dark spirits or lesser goal which may approach and is an excellent wealth increaser and protector of the household. They don’t need praying to often so they can get naughty if neglected. 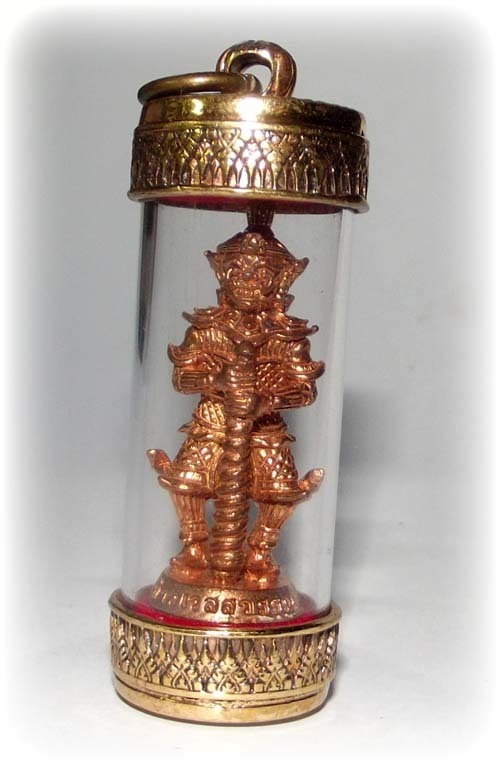 For those who worship the Taw Waes Suwan Asura Deva, Pra Pirab Asura Deva, or other similar deities of the same realm which are higher commanding officers of the Jadtu Maha Rachiga Heaven, then these devotees will benefit the most from the use of this statue, as a chosen item of worship and beseeching blessings. 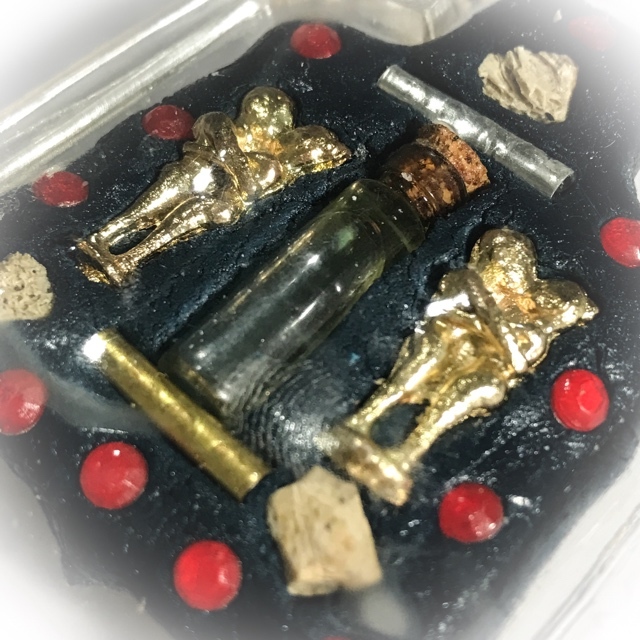 Pra Pirab Statue (Bhairab) with sacred powders , Tagrud, Pra Pirab Ruesi amulet and ‘Tian Chai’ candle inserted in the base. 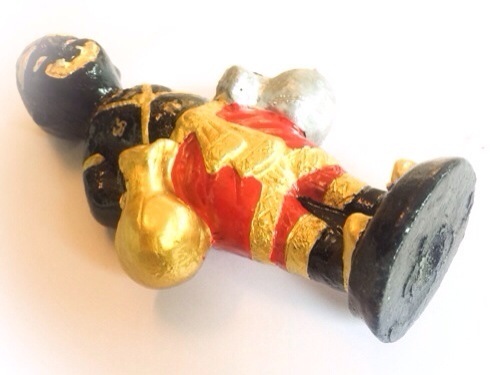 6 inches wide base and 8.5 inches high. 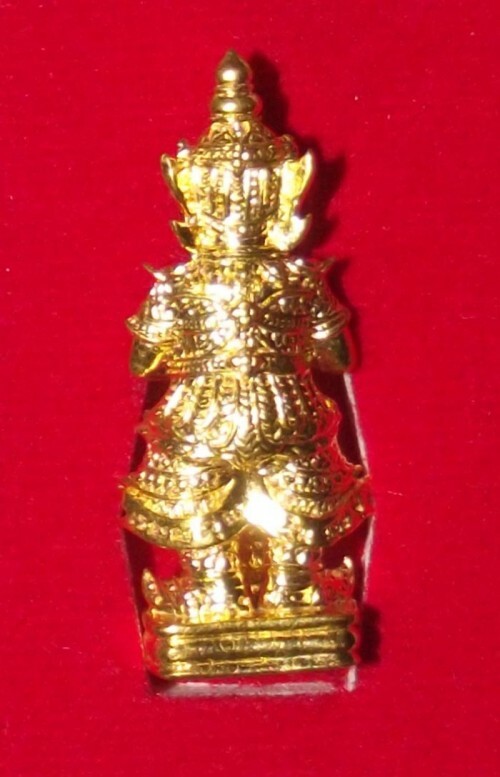 Made from Nuea Samrit (bronze). 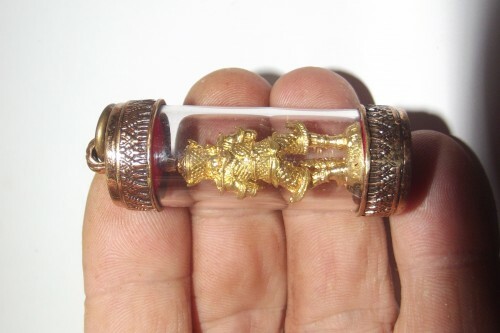 Pra Pirab is the Kroo Deity of all Dancing arts, and is the bestower of Luck and good Fortune, Happiness, Prosperity and ‘Amnaj’ (commanding power over others). 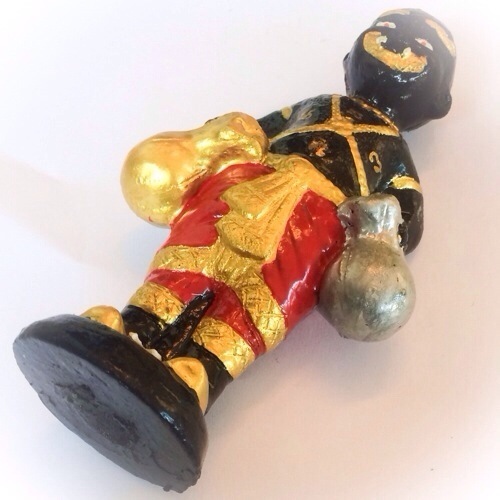 The Amnaj quality if Pra Pirab extends even to ‘Amnaj Maha Sanaeh’, meaning the great power of charm over others. This works both in Love affairs as well as in business or other issues such as politics, to aid in convincing others of your opinions. 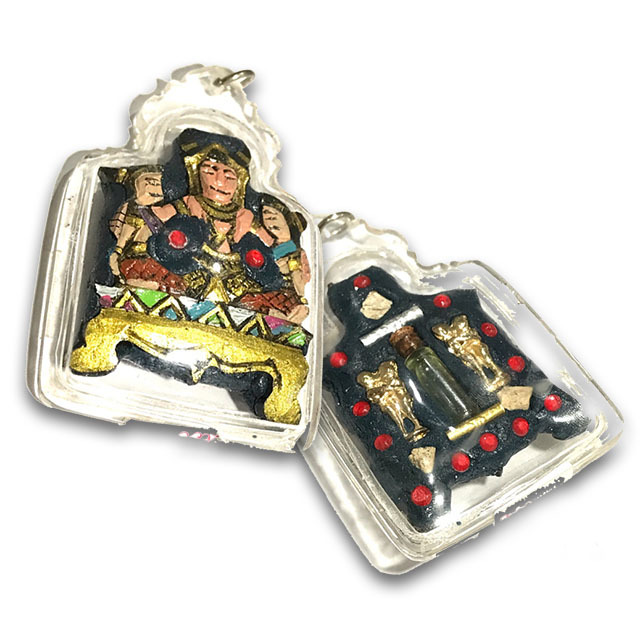 Pra Pirab is the Deva of giving or taking life, and has the power to remove any magic spells or dark magical influences. 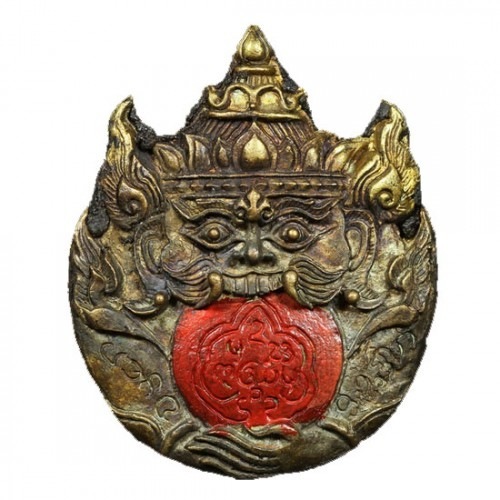 He protects and defends against Phuudt Phii and Bpisaat (ghosts, spirits and demons), and all kinds of evil magics. 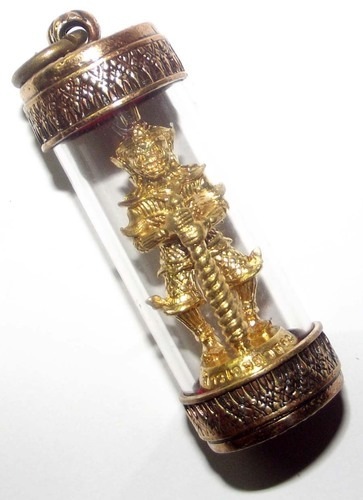 Luang Phu Ka Long has a strange crystal tooth in the center of his mouth, which is exactly as described in the legend of Hanuman, who also is reputed to have had a crystal tooth in the roof of his mouth. 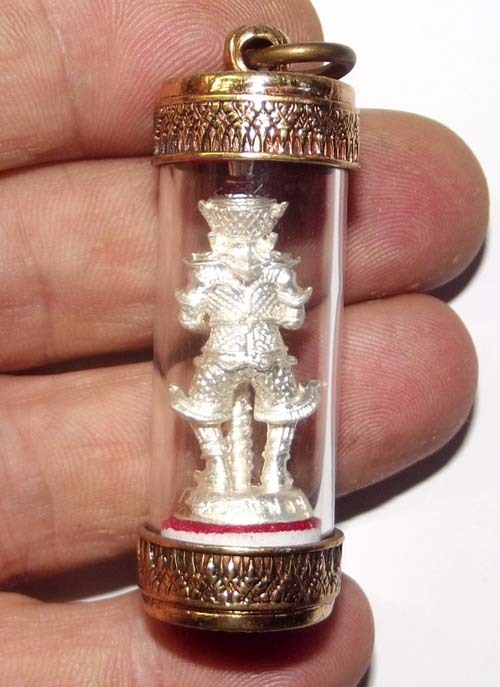 Whenever he would bless amulets or magical items, he would often put his finger in his mouth and touch the crystal tooth and then take his finger down and rub it on the statue or amulet. 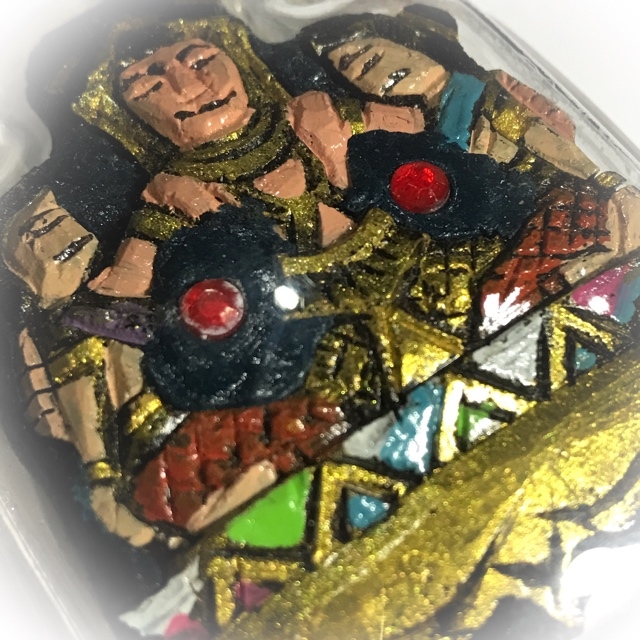 He said that some people were born with special things, and that each person was different, and that this crystal tooth was his personal special quality and ability. 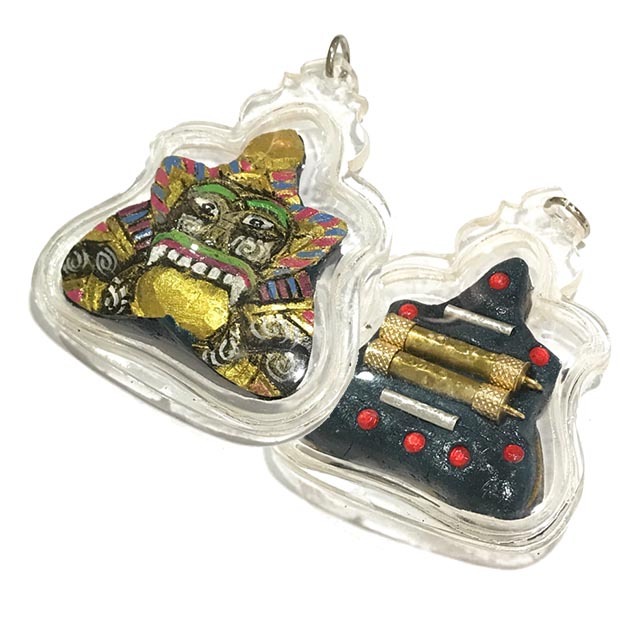 Luang Phu never advertised himself but somehow from mouth to ear he ended up being flooded with requests for sak yant, amulets and magical assistance. 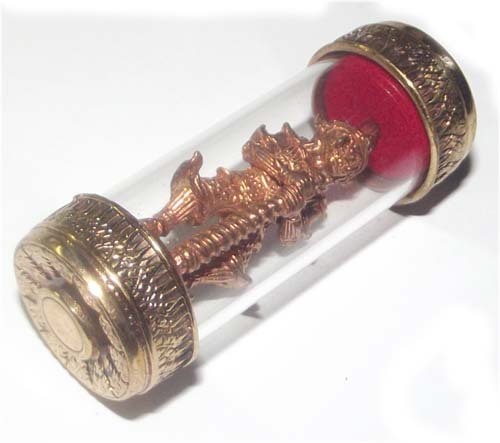 Without intention, he became perhaps the most popular modern amulet makers of the Modern Era. 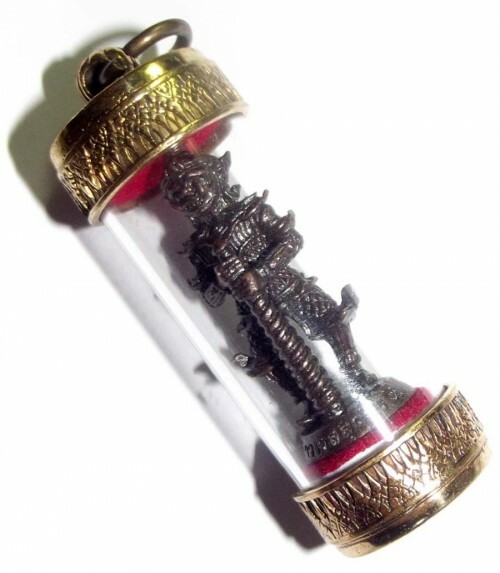 Luang Phu Ka Long has proved to be the phenomenon of the Decade as far as success with magic amulets is concerned. 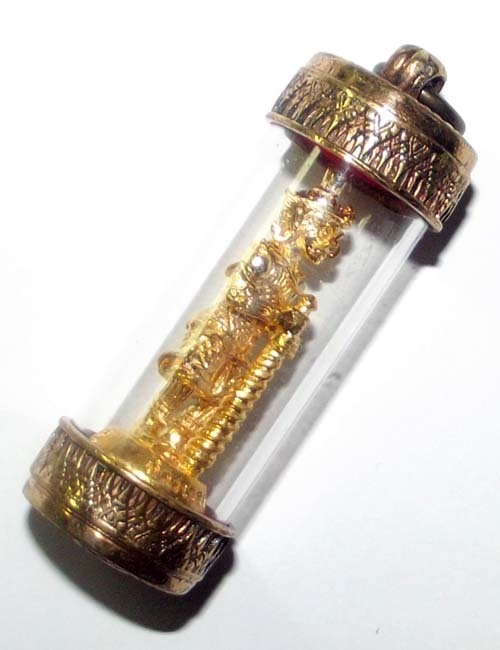 LP Ka Long amulets and Bucha items have revived immense success in every single edition, each amulet released has become an essential rarity in its own right. 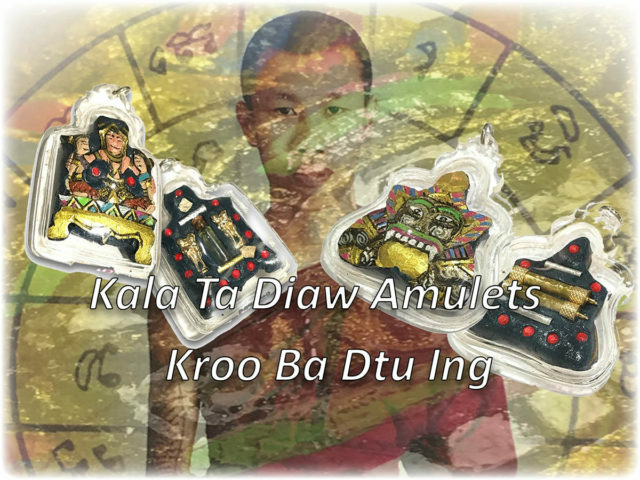 Since his passing away, his amulets have become ever rarer and are slowly disappearing. 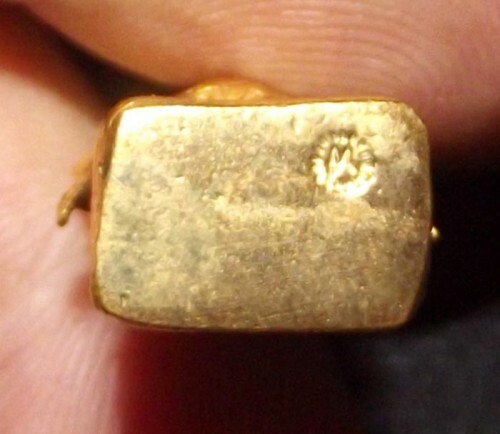 It wont be too long before almost all of them have gone, and only very expensive occasional options to acquire such an item will remain. 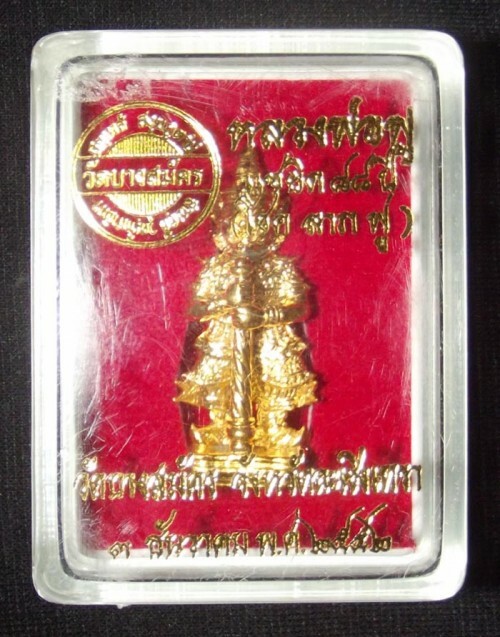 This Pra Pirab Bucha statue is the first ever edition made in 2550 BE and is now an extremely rare item to encounter already in the 4 years since it was made. 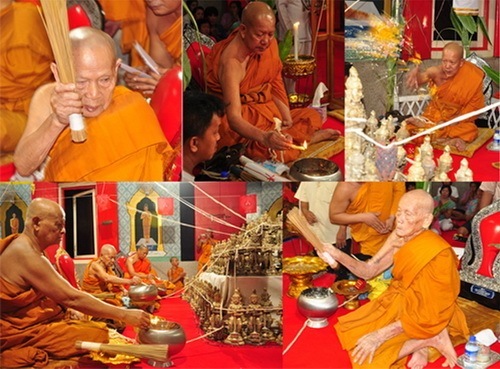 The base has various sacred powders including Pong Pra Pirab (Pra Pirab powder), Tagrud spell, a Pra Pirab Ruesi amulet, and a sacred victory candle from empowerment ceremony. 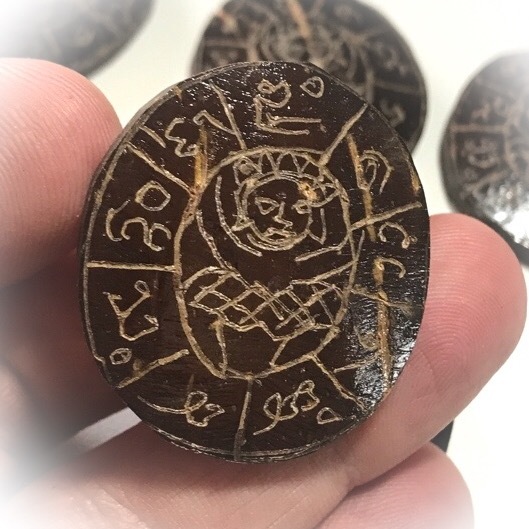 The immense Magical strength of Pra Pirab will cause any magic spells or other attempts to harm you be reflected back on those who send ill will to you. Those who try to harm you will end up being harmed by their own forceful energy. 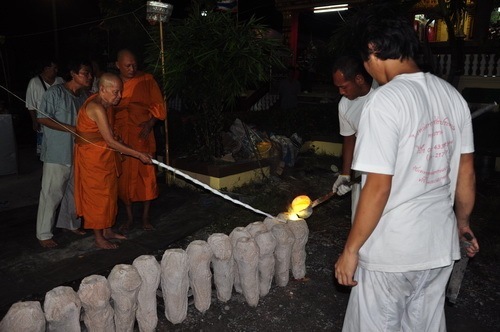 Apart from Luang Phu Ka Longs personal fame through his own merits, it is said that once, in his younger days as he was present for a Puttapisek blessing in which the Great Luang Phu To of Wat Pradoo Chimplee (master maker of the Pid Ta LP To amulet) asked after the ceremony who the young skinny monk was over there? 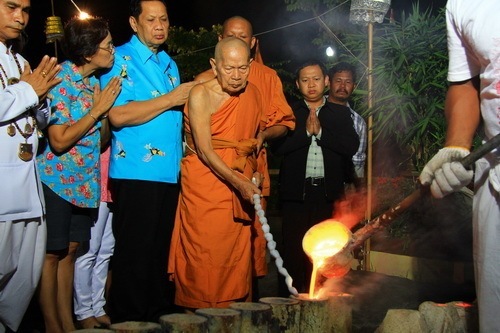 It turned out that it was Luang Phu Ka Long, and LP To remarked to the other high monks present; “how can it be such a young monk can have such psychic power in him i have never seen something like this before”?